The sight of ugly, dead blooms often spurs gardeners to remove the spent blooms and seedpods of their annual and perennial plants. This process is commonly known as deadheading. Deadheading can be continued throughout the spring, summer and early fall to prolong the bloom cycle of annuals and perennials. It may be an unwelcome chore, but if practiced on a regular basis, your garden will continue to thrive and bloom throughout the summer. Deadheading is performed by simply pinching off the dead bloom with your fingers, or for plants with thicker stems, pruning back the stem with the dead bloom on it. Removing the dead or dying blooms, along with seedpods, from a plant will often prompt the plant to rebloom. It is important to remove the dead blooms before the seedpod is formed. 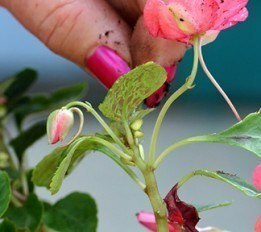 Deadheading before the plant has set any seedpods drives the plant to continue to rebloom in an attempt to once again form seedpods for reproduction. There are also plants that could be deadheaded, but many prefer not to in order to create winter interest with the dried seedpods. Some examples include any plants with berries, hydrangeas, and honeysuckle. For more information on deadheading, stop by Delhi Flower and Garden Center and talk to one of our many experts.